Interwest exclusively distributes 3M Window Film in the following states: Arizona, California, Colorado, Idaho, Illinois, Iowa, Kansas, Minnesota, Missouri, Montana, Nebraska, Nevada, New Mexico, North Dakota, Oregon, South Dakota, Utah, Washington, Wisconsin and Wyoming. 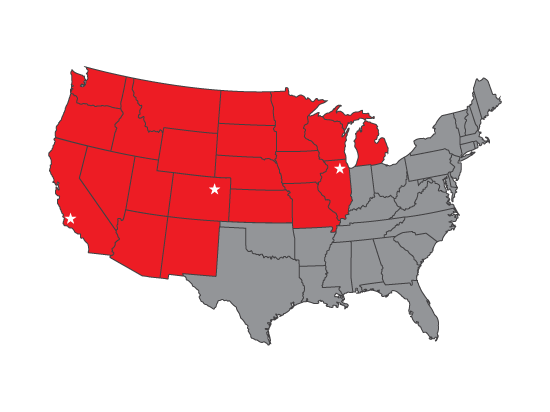 We are the largest distributor of 3M Paint Protection Film and exclusively distribute to the following states: Arizona, Colorado, Illinois, Washington, Indiana, Iowa, Kansas, Idaho, Oregon, Wyoming, Montana, Minnesota, Missouri, Nebraska, Nevada, New Mexico, North Dakota, South Dakota, Texas, Utah and Wisconsin. Interwest Tools services the entire United States. We stock and ship our tools from four warehouses across the United States (Atlanta, Chicago, Denver & Los Angeles) to provide you the fastest shipping times in the industry. Interwest Distribution Company, founded in 1985, specializes primarily in the marketing, sales and distribution of 3M Window Films, 3M & Venture Paint Protection Films, 3M 1080 Vehicle Wrap Films and Interwest Tools. Interwest fulfills orders from Atlanta, Chicago, Denver, Los Angeles and Seattle provide fast service no matter where you are. When you choose Interwest and 3M, you get the products, innovation and expertise of 3M coupled with Interwest’s commitment to helping our customers build better businesses with the products we provide. We thank you for your interest in Interwest Distribution Company and Interwest Tools. Please let us know what we can do to serve you.